The records of Pan American World Airways Inc. begin with the company's founding in 1927 and document the 64 year lifespan of a pioneer airline and international symbol of adventure and romance. The 1,500 linear foot collection contains evidence of Pan Am’s long list of accomplishments, which includes being: the first American airline to operate a permanent international air service, the first American airline to use radio communications, the first American airline to develop an airport and airways traffic control system, the first American airline to employ cabin attendants and serve meals aloft, the first American airline to develop a complete aviation weather service, the first airline in the world to offer scheduled transpacific passenger and mail service, the first airline in the world to offer scheduled transatlantic passenger and mail service, and the first airline to operate jets within the continental United States. 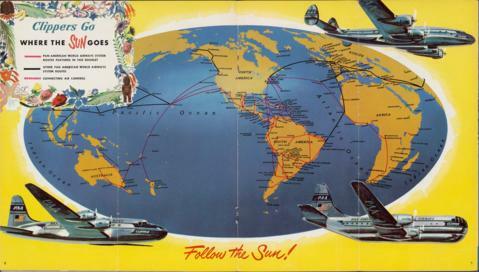 Among the many divisions, departments, offices and individuals that contributed to the daily operations of Pan Am reflected in this collection are: the Alaska Division, the Atlantic Division, the Latin American Division, China National Aviation Corporation (CNAC), Pan American Grace Airways (Panagra), the Technical Assistance Program, the legal department, the library, and the offices of: Pan Am Founder and Chief Executive Officer Juan T. Trippe, Andre Priester, C. Edward Acker, Charles Vaughn, Erwin Balluder, Everette M. Goulard, Franklin Gledhill, G. Erskine Rice, George Rihl, H. Preston Morris, Harold Bixby, Harold E. Gray, Humphrey Toomey, John C. Leslie, John C. Pirie, Karl Lueder, Kathy Babl, Najeeb E. Halaby, Mike Clark, Peter Paul von Bauer Chlumecky, Robert G. Thach, Russel L. Ray, Jr., Samuel Pryor, Sergio Bettancourt, Thomas G. Plaskett, William Langhorne Bond, William Mallory, William T. Seawell, William Van Dusen, and Willis Player. The types of records contained in the collection include: administrative reports, clippings (newspapers, magazines, etc. ), contracts (agreements, legal instruments, etc. ), corporate minutes, correspondence (letters, memos, telegraphs, telexes, etc. ), financial records (financial statements, bonds, expense accounts, taxation, etc. ), legal records (trial and arbitral proceedings, dockets, applications for court orders, exhibits, etc. ), logbooks, manuals, pamphlets (booklets, brochures, etc. ), periodicals, press kits, press releases, sales records (purchase agreements, invoices, etc. ), and timetables. Additionally, the collection contains audiovisual material, graphic material and over 2,000 folders of photographs. Among the noteworthy people referenced in the collection are: famed aviator and technical assistant to Pan Am, Charles Lindbergh; Haitian writer Pradel Pompilus; famed navigator and aviation pioneer Frederick “Fred” Noonan; the Beatles; Raquel Welch; former British Prime Minister Winston Churchill; former Presidents Franklin Roosevelt, Dwight David “Ike” Eisenhower, John F. Kennedy, Lyndon B. Johnson, Richard Nixon, and Ronald Reagan; and former First Ladies Eleanor Roosevelt and Mamie Eisenhower. Collection highlights include: correspondence between Charles A. Lindbergh and Juan Trippe from 1933 regarding the establishment of a transatlantic air route, many internal publications containing detailed accounts of everything from the operations of company divisions to biweekly memoranda from Juan Trippe to top executives regarding changes to corporate structure, hundreds of files documenting the vital role Pan Am played in World War II, and the records of National Airlines obtained during the Pan Am/National Airlines merger in 1980. Absent from the collection are employee medical and personnel records. These were retained by Pan Am during bankruptcy proceedings. Their disposition is unknown. Thanks to a grant from the National Historical Publications & Records Commission (NHPRC), the records of Pan American World Airways, Inc. have been arranged by theme and in some cases format. Themes were identified by analyzing folder titles. Topic modeling analysis of the folder titles in these themes confirmed that they logically reflect the data contained therein. Folder titles were obtained from a folder inventory created by Marcia Evanson Heath, Archive Assistant, between 1999 and 2003. Folder Numbers: Because the collection was used by researchers for twenty-three years prior to the finding aid revision, original location information has been repurposed as folder numbers. Folder numbers therefore consists of three numbers: original accession number, original box number, and original folder number. Folder Descriptions: Many folders include descriptions providing an overview of the contents, with particular attention to topics covered, the presence of photographs, audiovisual material, graphic material, and 3-D objects that can be found inside, and the bulk of folders. Topical descriptions utilizing the verb “contain” indicate that the contents of the folder pertain exclusively to the topic described. Topical descriptions utilizing the verb “include” indicate that the contents of the folder pertain to the topic described as well as other topics not described. For bulky folders, which have been divided into smaller folders, the number of subfolders is provided in these descriptions. Format Organization: Folders consisting exclusively of photographs, audiovisual material, or graphic material and 3-D objects have been organized by format and then by theme. Thematic organization of the "Photographs" series follows the thematic organization of the rest of the collection. For example, photographs of the Boeing 747 are found under “Photographs, Aircraft, Airplanes, Boeing, 747.” Folders containing documents as well as photographs, audiovisual material, graphic material and 3-D objects have not been organized by format. Download the Finding Aid: To download a searchable PDF of the finding aid from Windows and Chrome or Internet Explorer, click on "Printer-friendly" in the upper-right of the screen. After the new page opens, right-click the mouse and select "Convert to Adobe PDF" (Internet Explorer) or "Print" and then "Save" (Chrome). This collection is open for research, but is kept in an off campus storage facility. Please contact Special Collections with the boxes you are interested in prior to your visit, and allow up to 1 week for delivery of materials. Some audiovisual material may not be used due to hardware restrictions. Pan American World Airways, Inc. Records Finding Aid © 2014 University of Miami. All rights reserved. Requests to reproduce or publish materials from this collection should be directed to asc.library@miami.edu. On October 6, 1992 Pan American World Airways, Inc. filed a motion with the United States Bankruptcy Court, Southern District of New York, asking for it to authorize the abandonment of “certain unnecessary and burdensome records” and to approve the establishment of a procedure to select such records for abandonment in an effort to minimize storage and maintenance costs. The records were stored in seven locations: (1) Rockleigh, New Jersey, (2) Jamaica, New York, (3) Miami, Florida, (4) Tappan, New York, (5) Washington, DC, (6) Pierce Leahy Corp. (now Iron Mountain Inc.) facilities, and (7) overseas locations. The following records were not to be abandoned: (i) environmental records required to be kept by relevant federal regulatory agencies; (ii) employee medical and personnel records; (iii) files and records maintained by debtors’ legal department (including those relating to both pending and inactive litigation); (iv) tax-related records; (v) aircraft maintenance and flight safety records required to be maintained by the Federal Aviation Administration; (vi) all pension records relating to the defined benefit and defined contribution plans previously administered by Pan Am; and (vii) any records considered material or relevant to ongoing litigation in which debtors were involved. At the time of the motion, only a “discrete portion” of Pan Am’s total records had been selected for abandonment. The process whereby these records were selected was described as “a careful process of internal review conducted by operational personnel.” Pan Am proposed an “additional multi-layered review and approval process” that involved submittal of a form describing the specific records sought to be disposed of to the following parties: (i) in-house legal and tax departments; (ii) outside counsel (Cleary, Gottlieb, Steen & Hamilton); (iii) counsel for the Official Committee of Unsecured Creditors; (iv) counsel for the Ad Hoc Committee of Administrative and Priority Creditors; and (v) counsel for Delta Air Lines, Inc. It is not clear whether this process was adopted. About one hundred former Pan Am employees, organized by the Pan Am Historical Foundation and under the guidance of the University of Miami Libraries Special Collections, then participated in a culling project during which the collection was reduced to around two thousand boxes. They focused on materials from before the 1930s, during WWII and the Airport Development Program, and letters from former Pan Am presidents. The University of Miami Special Collections received all the paper, photographic, and audiovisual records, totaling 1,600 boxes, in two shipments (in 1992 and 1998). HistoryMiami (then The Historical Association of Southern Florida) and the Smithsonian received the 3-D objects. The following adjacent collections are available for research at Special Collections: Basil Rowe Papers, Clipper Pioneers Collection, Daniele Desmoulins Perez-Venero Papers, Dolores Pla Menocal Photograph Collection, Donald W. Thomson Papers, Dorothy Brannen Thomas Collection, Dorothy E. Mills Collection, F. Charles Ruegg Papers, Humphrey W. Toomey Papers, Ione Wright Papers, J. H. Brown Papers, James Wendler Collection, Kimball J. Scribner Collection, L. J. Easterbrook Papers, Leonard Albasi/Gill Family Collection, Louis J. Hector Papers, Pan American Historical Foundation Records, Port Washington Public Library Oral History Collection, R. A. Seymour Papers, Randy Liebermann Collection, Sidney Serebreny Papers, Roy Keeler Collection, Vincent A. Jablon Papers, William C. House Papers, and William J. McEvoy Papers. We also recommend these collections housed by external organizations: Charles Augustus Lindbergh Papers (Yale University Library), Florida Photographic Collection (Florida Memory Project), State Archives of Florida History of Aviation Collection, University of Texas Special Collections, Pan American World Airways Collection (HistoryMiami), Records of the Civil Aeronautics Board (National Archives), San Diego Air and Space Museum Archival Collection, Smithsonian Air and Space Museum Archival Collections, and Syracuse University Pan Am Flight 103 Lockerbie Air Disaster Archives. Finding aid made possible by a two year grant from the National Historical Publications & Records Commission (NHPRC).